Jadeja was picked in the World Cup squad on Monday. 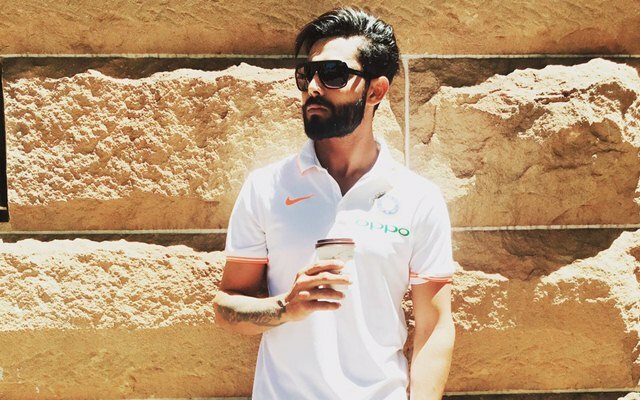 As the entire country is now going through the general election phase, India cricketer Ravindra Jadeja is involved in politics more than ever. The reason behind the same is his wife herself fighting for a seat from the Jamnagar constituency. Riva, Jadeja’s wife, had joined the Bharatiya Janata Party (BJP) on March 3 in Jamnagar in the presence of the eminent BJP leaders from the area. Riva’s journey in politics had started last year only. In October last year, she had joined Karni Sena and was appointed the President of Women’s wing in Gujarat. At that time, she had played down her chances of joining politics, insisting that she primarily wanted to do something good for the community. However, she then changed her mind and decided to join the ruling party just days before the upcoming 2019 Lok Sabha elections. Interestingly, Ravindra Jadeja’s father and sister joined Congress earlier this month. The all-rounder’s father Anirudhsinh and sister Nainaba joined BJP’s opposition party at an election rally in Kalavad city of Jamnagar district on Sunday (April 14). No surprises then that the Jadeja house is divided due to the family members’ divided loyalty. However, the star allrounder has made it clear that he would support his wife and BJP. Ravindra Jadeja, meanwhile, had a memorable Monday. The Saurashtra star, who had fallen down the pecking order in ODIs not very long ago, was named in India’s 15-man squad for the upcoming World Cup. Jadeja, who was part of the World Cup squad four years ago too, had returned to the ODI team during last year’s Asia Cup and has impressed since then. Jadeja has fond memories of delivering in ICC tournaments in England. He was the highest wicket-taker in India’s victorious 2013 Champions Trophy campaign and will be eyeing a similar performance in the World Cup.